In the comments of a recent post, Danny was asking about the tweaks for the Dungeon Saga Dwarf and Barbarian. The simplest answer is posting a pic of the current working copies. Those of you who played the Dungeon Saga rules from the Kickstarter will see that they have changed very little. This entry was posted in Dungeon Sagas. Bookmark the permalink. Thanks for sharing this Jake, much appreciated mate. So indeed the Barbarian becomes more powerful in dealing damage (loses a bit of speed to allow the Elf to be the fastest mover in the group – which you said before) and the Dwarf loses a bit of raw damage dealing power but gains what could be a very powerful addition to his ability in many circumstances. I feel this definitely helps separate the two fighters and sends them both a little further down their own paths of combat specialty. The Dwarf will be a great methodical defensive fighter, being able to soak up a massive amount of attacks being directed his way with his Armour 4 and special ability, whilst ceaselessly dealing it right back at his attackers…and he can even “Occupy” a group of monsters for a round, drawing the heat from the other Heroes at a crucial or pivotal moment, or perhaps blocking a path or taking on a delaying role whilst others make a clean break or focus on something more technical…and the Barbarian will be great to aggressively get in the thick of it and lay all about him with a blood drenched axe!!! Does the Barbarian retain his ability to ignore the -1 dice modifier if injured? Someone mentioned at some point that it would probably be a good idea to have this on the Barbarians card (can’t remember who it was who mentioned it, sorry). I thought this was a good idea…if he still has it, that is. I like both these hero stats very much, from all the games I had, these tweaks just feels right. I’m going to get a couple/few games in tomorrow night with these tweaks. Good, characterful changes, thanks for sharing it. Am I correct in interpreting the circles at the bottom of the card as a damage tracker? So the Dwarf has 5 ‘wounds’ while the Barbarian has only 4? 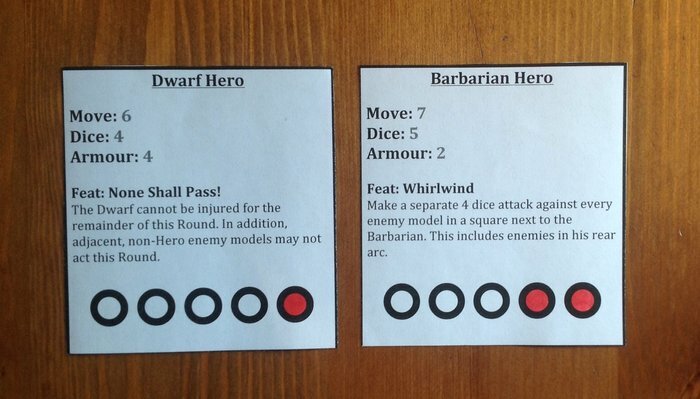 I think they both have 5 wounds each (as with the previous Alpha Heroes), however these cards are probably either during, or at the end of a game where the Barbarian took 2 wounds and the Dwarf took 1 wound…I could be wrong though. All heroes have 5 wounds. When a hero loses a wound they place a counter over the left-most circle. When the only circles left visible are red, they are injured (and at -1 to some dice rolls). This allows different heroes to worry more or less about being damaged. This replaces the barbarian’s previous ability to ignore injuries. Oo! I like that! Hit point tracker AND tracking injuries all in one. I love the way things server multiple purposes. I also like this! Gives a little more granularity to how tough heroes are compared to each other. So does this mean the Barbarian’s whirlwind 4 dice can be modified or no? I like the injury/wounds mechanic idea. Very well done. No, the Barbarian’s feat is 4 dice regardless of the situation he is in. His target, on the other hand, is modified as normal. Good to know. Cheers, Jake. I’ll come back to the 1 counters. The goblins aren’t currently my main concern. However, I expect to use the DKH approach of then getting 1 injury for 1 hit and dying on 2. There is, after all, nothing especially remarkable in the way goblins react physically to damage. Been wondering about living critters, now we know. Great to see this back to the worktable. Can you give any ideas on the stats (armor) of a higher level dwarf with say magic armor and a magic shield? I’m still working on the stats for Mortibris and his bosses, so the final level of the heroes is waiting on that (as they need to be in balance). I have been playing around with the hits you have given (revising my reference sheets) even buying the digital versions of the earlier games. A couple of questions on direction of some of the rules. I hope the out numbering stays with the simple two adjacent enemy models with no reference to friendly a but I wondered if zombies would regain a version of “mob rule”. The other rule I really am curious about is “large” as the new models are 50mm bases overlap will be more of a problem than the old 40mm bases. Will the models take up 4 squares with penalties to fit down narrow corridors (taking 2 squares on the straight 3 on a corner) making placement of adjacent large creatures possible, or is the plan to continues with the single square with overlap?